Here’s the Paulding County GA Real Estate Sales Report for February 2019. 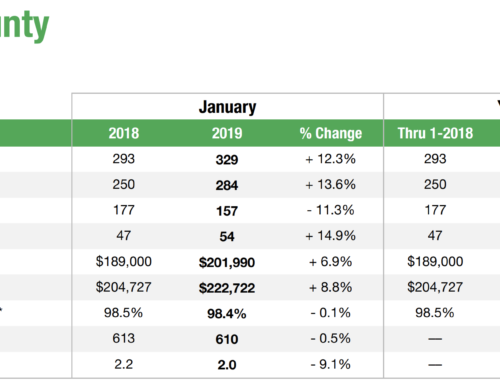 This report gives detailed real estate market data for Paulding County in February 2019. With 2.3% fewer new listings and 6.3% fewer closed sales, the February 2019 Paulding County real estate market was a bit slower than last month, despite the small 1.1% increase in pending sales. But sales did happen, and those sales resulted in a 1.4% decrease in inventory, and a 4.5% decrease in the months supply of inventory. Despite the slightly slower market pace, home price increases found footing. The median sales price increased 8.5% to $207,570 while the average sales price increased 5.4% to $222,370. The number of days on the market until sale decreased by 11.9%, while the percent of list price received barely moved down by .2%. There’s even more interesting details in the full report. To view the full February 2019 real estate sales report for Paulding County, GA, just click here.